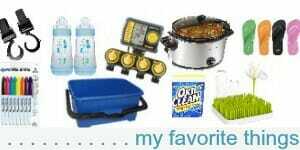 DISCLOSURE: None of these products are sponsored in any way, however some of the links below are affiliate links — which means I may get a VERY small percentage of the sale if you make a purchase through my links. 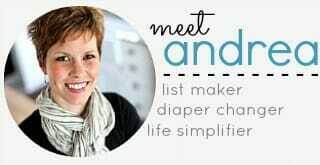 However, I hope you know that I’m only promoting the products below because I use them EVERY SINGLE DAY in my own home and life! Read my full disclosure policy for more information. Now that Nora is older, we use our umbrella stroller a lot. It’s so much easier to transport than a larger, bulkier travel system. We keep our umbrella stroller in the back of our car all the time and haul it out as needed. The only thing I didn’t like about using the umbrella stroller is that it didn’t have any type of cup holder or organizing tray. 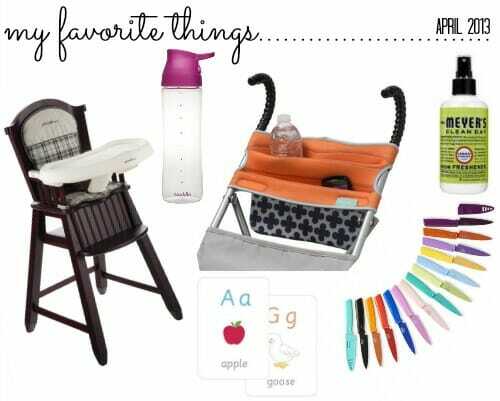 However, I came across the Infantino Umbrella Stroller Organizer and my “problems” were solved! 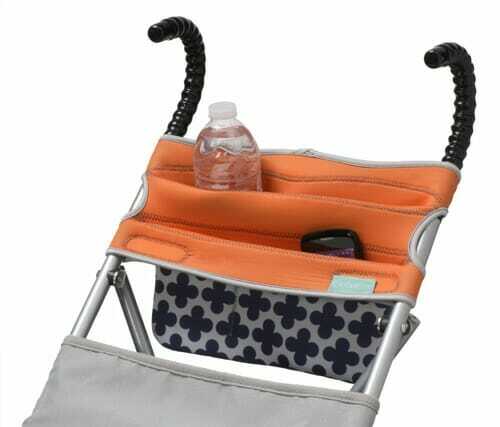 This adjustable organizer will supposedly fit any umbrella stroller and has compartments for 2 water bottles plus snacks, a cell phone, and more. It’s really easy to install, and it looks fabulous with our bright orange Chicco umbrella stroller (we purchased our stroller for $20 via Craigslist!) Plus, you do NOT need to remove it when you fold up your stroller. 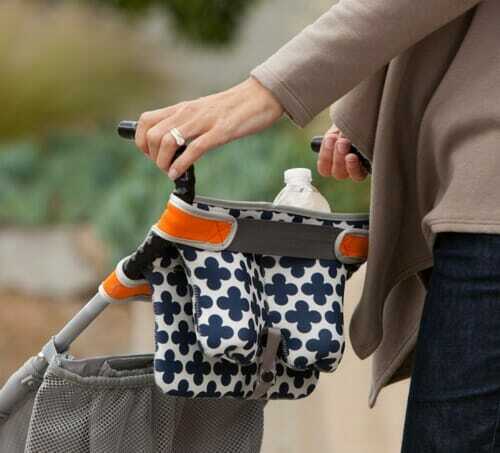 The flexible fabric just folds right up with the stroller. 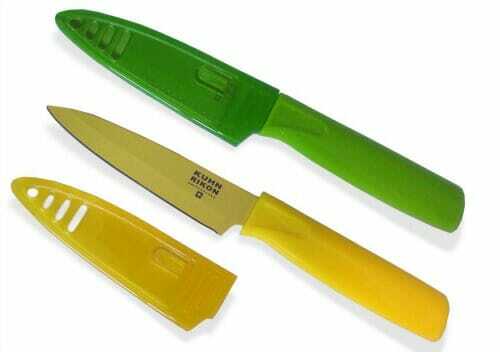 My Kuhn Rikon Paring Knives are some of my favorite knives — not only because they function really well, but also because they come in these fabulously bright colors. I’ve been using these paring knives on a daily basis (and washing them in the dishwasher ALL the time) for over 6 years and they are still super sharp. They are very light weight and have a comfortable grip, plus they all come with a matching blade cover for safety. 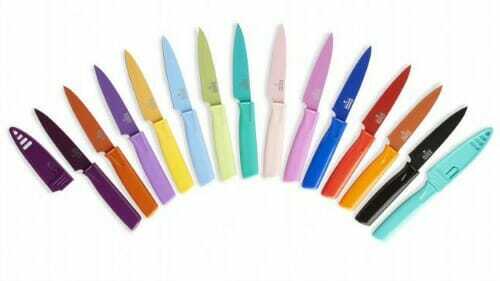 Kuhn Rikon has a huge selection of other knives as well — and they all come in these lovely colors! They have zebra printed knives, polka-dot knives, and even a watermelon knife that looks like a watermelon! 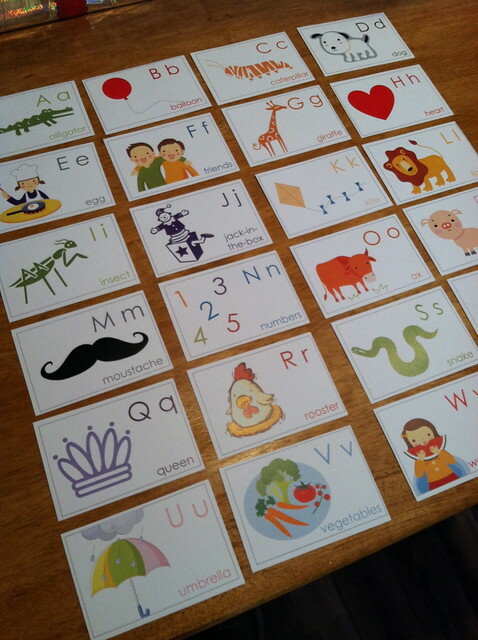 Even though Nora is not quite old enough to understand the alphabet, I’m ready whenever she is with these super cute (and totally free) flashcards. I printed them on card stock several months ago and I think I’ll laminate them before we actually start using them. I don’t see these exact flash cards available any more, but Mr. Printables has loads of other extremely cute flash cards available to download and print — all for free! If you’ve seen any pictures of me here on my blog, you’ve probably noticed that my pink water bottle is ALWAYS right next to me. If you see me driving, it’s ALWAYS in my cup holder. And if I’m out and about, it’s ALWAYS in my bag. It’s the Aladdin One-Handed Water Bottle — the only water bottle I’ve ever had that is fully operational with one hand (which is really nice when you’re carrying a baby with the other hand!) When you squeeze the button on the back of the top, it automatically opens the drinking spout and lets water out. When you release the button, the flap closes and it doesn’t spill. I’ve been using the exact same water bottle every single day for almost 3 years and it’s still in perfect condition. IT. DOES. NOT. SPILL…. ever! I’ve given this water bottle as gifts numerous times, and every single time the recipient always raves about how much they love it. The only negative quality I can even think of is that it’s a bit heavy when it’s totally full of water — but that’s mostly because it holds so much water. The bottle itself is relatively light weight. 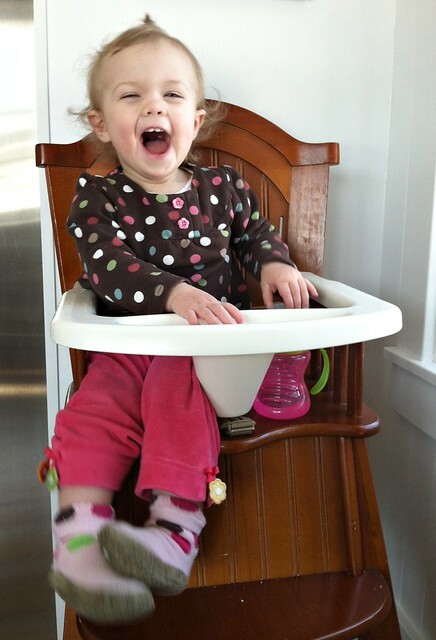 We absolutely love, love, LOVE our Eddie Bauer Wooden Highchair — and so does Nora! They are pretty expensive, but we found our’s on Craigslist (of course we did) for only $25 and it’s in fabulous condition. I almost always see these on Craigslist too, so definitely look there first! 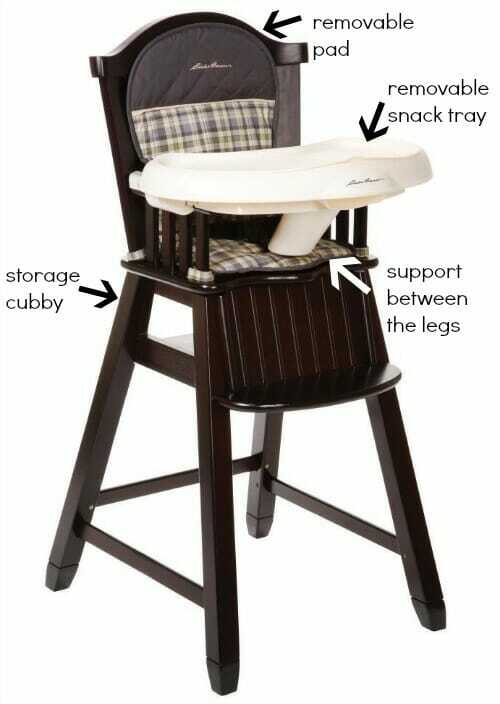 It has a storage cubby on the back side for storing bibs and other baby kitchen items. It’s SUPER easy to clean! The only negative thing about this chair is that it doesn’t recline or fold up for easy storage. However neither of those things matter to us at this point. Also, if you want a chair like this that DOES recline, Eddie Bauer makes one! I love all things lemon — I also love all things “Mrs. Meyers”. I’ve tried many different room fresheners and Dave and I both agree that the Mrs. Meyers Lemon Verbena is our favorite. It just smells fresh — not like those stinky gas-station bathroom air fresheners or any of those other air fresheners that basically just make a bad smell worse. We keep this in our bathrooms, but frequently use it in the kitchen, Nora’s nursery, or anywhere else we need a fresh burst of lemon scent. I have so many favorite things — but I’ll save the rest for future months. What are some of your current “favorite things”? Filed under: Life • My Favorite Things • Misc. Thanks for the recommendation on the water bottle. I bought one for myself and I love it! Finally!! Now, what do you recommend for a kid water bottle? This one is just too big for my six and four year old – what do you use? I wound up ordering 10 of the water bottles–thank you for letting me know about them! My kids do Tae Kwon Do, and when they have their gear on, water bottles can be tricky. This one-handed one is perfect for them. We loved them so much, we bought more for my husband, our music teacher, etc. 🙂 Keep the “favorite things” posts coming! I bought the Aladdin water bottle and I LOVEed it! The problem is that I dropped it and the whole bottom busted! I contacted them and they are sending me a new one. Has anyone else have this issue? It was only about a week and a half old, only hand washed and I dropped it on a laminate floor at hand level. ??? That’s super weird Beth — I’m glad they are sending you a new bottle. I’ve dropped my water bottle HUNDREDS of times with not so much as a scratch. Nora has literally thrown my water bottle on our cement driveway and nothing happened. The only way I can imaging it would ever break is maybe if the bottle was filled with water, frozen, and then dropped?? Sorry for the trouble but glad you’re getting a new water bottle! lol nope just plain water not frozen or even chilled. I stood there kinda in shock cause I have a glass water bottle with a silicon case around it and I dropped that on cement and it didn’t break. Either way if anyone does have issues with theirs talk to Aladdin’s customer service they were very nice and helpful about it. Thanks still for recommending it I really like it! 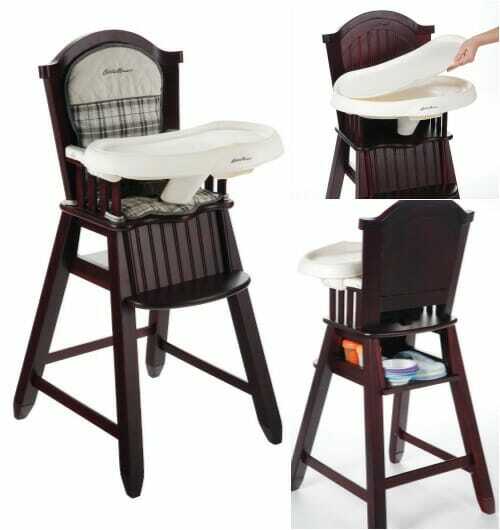 The thing I love about the Eddie Bauer highchair is the small footprint. I have a daycare in our home so it will be part of kitchen for many years and it was important that it not take up a lot of space. It is also very sturdy – 10 years and going strong! I have one of those paring knives. They are AWESOME! I checked out the water bottle on your recommendation – but it’s not available in the UK! Fortunately there are some other Camelbak water bottles available so I’ll be trying one of those. Shoot — that’s a bummer. However I’ve used Camelbak water bottles in the past and they are nice too! I have one of those knives, and I love it! It is a great all purpose knife to have in my kitchen! My favorite thing is this Black and Decker one cup coffee maker. You use your own grounds and it has a reusable filter, so it’s way more economical than a keurig, and I think it makes a great cup of coffee. During the week, I’m the only one home to drink it, so it makes no sense to make a big pot (we have a larger coffee maker as well), so it’s perfect for me! It has a really small footprint in our kitchen, plus the machine itself was under $20. One of my favorite things is Forever Living Aloe Berry Nectar. It is full of antioxidants and is healthy for my digestive tract. As for cleaning, my favorite thing is MPD (multi purpose detergent). It’s all natural, and I use it for many things: washing dishes, cleaning the kitchen, cleaning the bathroom, washing the floors, cleaning the mirrors, and doing laundry! 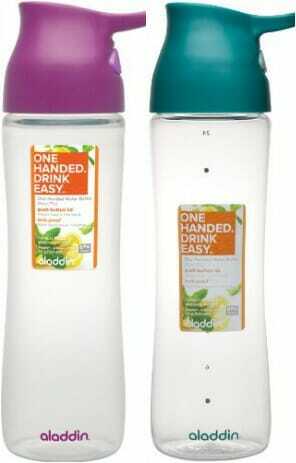 I just ordered the Aladdin One-Handed Water Bottle. I have been using the same Nalgene bottle for 6 years and the loop on the lid recently broke. My water bottle NEVER leaves my side, and your recommendation was the push I needed to get a new one! Also, I’ve been using the Mrs. Meyer’s Lemon Verbena countertop spray since my college roommate’s mom bought it for our apartment almost 10 years ago. Love that stuff! 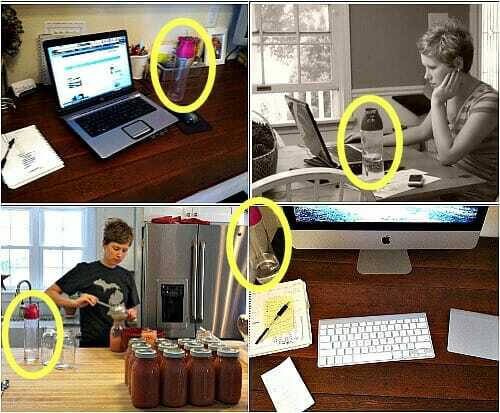 The water bottle pictures made me laugh. I always have my water bottle next to me as well, but it’s high time for a new one. I’ve never heard of a one handed water bottle. Thanks for the recommendation! 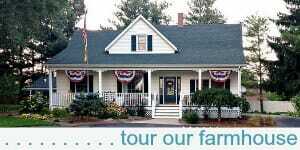 Where do you purchase Mrs. Meyer’s products? A long-time lover of all things Mrs. Meyers Lemon Verbena, I ventured out on a limb and tried the Basil countertop spray and LOVED it. I also hosted a fun “Favorite Things” party (each guest brought 3 identical items under $10 and left the party with 3 different items) and received a Mrs. Meyers Geranium scented candle. I am convinced that all of their scents are wonderful. Other favorite things, because I love this topic: my griddle, Press n’ Seal, Oil of Olay Luscious Embrace Body Wash, Bounce Dryer Bar, Bath & Body Works ‘Into the Wild’ body spray, hydrangeas, Real Simple magazine, York peppermint patties, and Cadbury eggs. 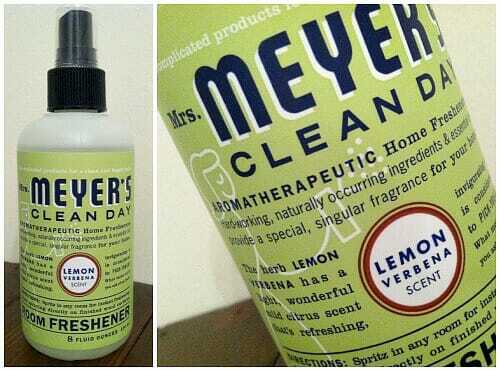 I love the Mrs. Meyers Ironing Spray in the Lemon Verbena – it makes ironing (when I absolutely must…) a little easier! Sherri, where do you buy the ironing spray? I can’t seem to find it in stock anywhere-it sounds awesome and I want to try it! I hope it’s not discontinued. I love reading about other people’s favorites. Those knives look super fun. I like bright colors. And I am going to be checking out the water bottle! The umbrella stroller organizer is the best idea ever! When my kiddos were little, that was always my gripe with the umbrella stroller. You just have to have a place on a stroller to put stuff!!!! 🙂 I liked to keep the umbrella stroller in our vehicle, so that it was available anytime we needed a stroller.